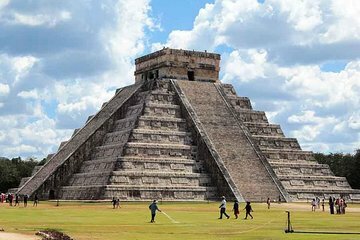 Oplev Mexicos gamle historie førstehånds på en dagstur til Chichen Itza med rundturstransport fra Cancun og Riviera Maya hoteller. Efter en rundtur i de antikke maya-ruiner giver en tosproget guide, køle ned med en svømmetur i en afsondret cenote, et naturligt hulhul unikt for Yucatan halvøen. En buffet frokost og flaskevand er inkluderet for din bekvemmelighed. I'm not happy with this excursion. We left our hotel at 7.15, and there was a big old bus. Then we walked another hour to pick up people from other hotels and went to the meeting place-9.20 am. From there, they transferred us to other buses better. It was a big hurry to find the right bus we were supposed to be. Then we traveled to the cenote. David was fun. At the cenote we sat for a long time - there was simply nothing to do. we waited for lunch. Lunch was not good about an hour and a half after bathing was just a waste of time - there's just nothing to be done there. It was not until then that we went to Chichen Itza - they did not give us water but wrote that it was on. We had to have an hour and a half in common. hour hike and 30 minute self-examination. The place is abominable. The guide was good, but it was an hour and 15 minutes. We only had time to fast and to leave. If we were gathered with a luxury van instead of a big old bus, we would leave at 8 o'clock and save a good deal of time. They did not give us water, as it was written! A lot of time in cenote, a little time in Chichen itza! We returned very late and very tired.